While Hang 10 Tacos is a classic best food truck in la, the menu features a wide selection of delicious items with all the bells and whistles you expect to find in LA. Let’s face it. Everyone knows that gastronomy is unique in Los Angeles. The area’s local chefs are world famous for their creativity with recipes and willingness to try new combinations, rare spices and exotic ingredients. Plus, they consistently use only the best, freshest ingredients because LA-area residents are health-conscious diners. That’s the same food philosophy followed by Hang 10 Tacos. Our team strives to produce only first-class cookery for people who expect the best. If you’re a big fan of food truck in Los Angeles, you’ll want to try all of Hang 10’s yummy tacos. Each one is named in honor of a beautiful California beach from Baja to Santa Cruz. Beef, chicken, seafood and pork tacos … we have them all. And if you are a vegetarian, we will make the best tasting veggie taco you’ve ever put in your mouth. Watching your weight? Order any of our tacos served on a leaf of crisp lettuce. As an added bonus, every batch of our tasty sauce or bowl of guacamole is tenderly handmade with love for our valued foodie customers. We know they are particular about what they eat. They know and appreciate terrific tacos, spicy sauces and great guacamole, all made from the best ingredients. We invite you to join them. We would love the opportunity to pamper your palate too. 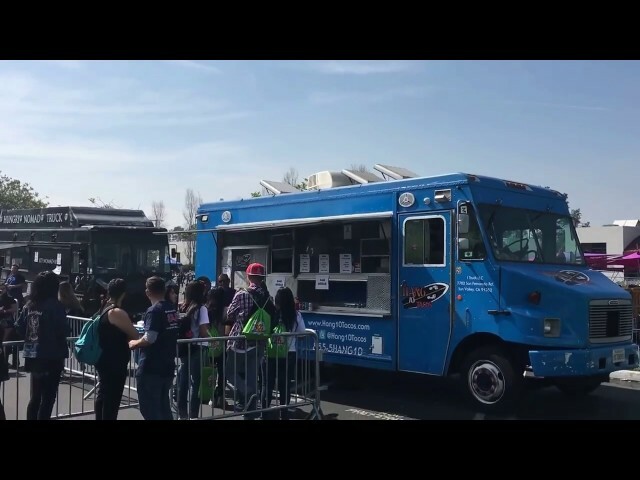 Everyone agrees that Best food truck In LA produce the best eat-on-the-street foods found anywhere in the United States, and Hang 10 Tacos is among the unsurpassed leaders in rolling restaurants. In addition to dishing up the freshest tacos in LA, Hang 10 Tacos serves a true carne asada (better known as the BBQ of Mexico). There are no short cuts here. This time-honored dish is carefully cooked and served the way traditional Mexican cooks have done it for decades. Thin slices of beef are marinated in fresh lime juice, garlic, onion and black pepper and then grilled over a blazing hot fire. Served on a flour or corn tortilla, our carne asada is generously slathered with pico de gallo or salsa, then dotted with chunky globs of guacamole. Everyone loves it, and no one goes home hungry. Needless to say, our competitors are jealous. In fact, they are as green as our guacamole.